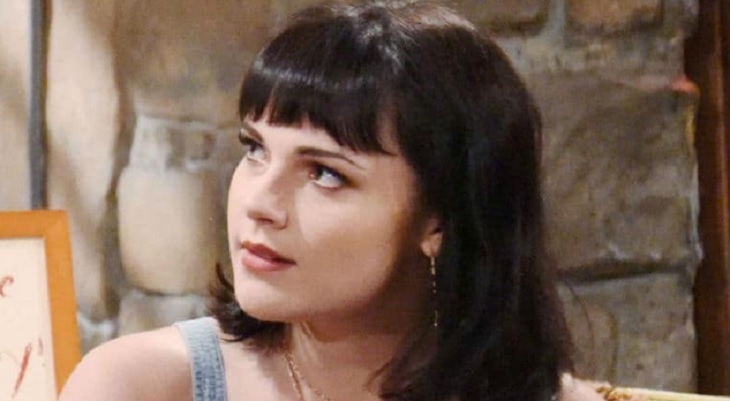 How can Tessa (Cait Fairbanks) be trusted on ‘The Young and the Restless’? After admitting to being the blackmailer, why would the coverup crew, Mariah (Camryn Grimes), or anyone in Y&R’s audience believe Miss Porter now? Who knows, Tessa may have been (and still is) secretly involved with the trafficking scheme that ensnared Crystal (Morgan Obenreder) on Young and the Restless? The bit that played out last summer, involving coyotes who moved Tessa’s sister across the border into Canada and are allowing a repayment plan to exist to gather the owed money seems utterly preposterous. Instead of hired goons, those dark figures could be part of her overall operation. Tessa claims to have happened upon information in Nick’s (Joshua Morrow) email files that provided her with the security camera video which showed J.T.’s (Thad Luckinbill) body-move. Really? Okay, she doesn’t necessarily have to be flying solo as Nikki (Melody Thomas Scott), Vickie (Amelia Heinle), Sharon (Sharon Case), and Phyllis’ (Gina Tognoni) tormentor. Maybe she met Ian Ward (Ray Wise) while working in the underworld at some past, off-camera point in soapy time, or another unscrupulous persona is involved in this extensive scheme. A potential key moment was seen in recent weeks, after Tessa admitted her supposed full truth to Mariah. At that time Grimes’ character was told that Noah (Robert Adamson) was never loved. Instead, he was going to be ringed for money and then divorced. Tessa then wove the term “long con” into her apparent reveal. Yes, current events feel like that now. Anyone who would be diabolically clever enough to force a quarter of a million dollars out of Nikki could have easily faked the few instances of seeming abuse by her so-called attackers. Tessa could possess the type of cold-blooded heart that would use Mariah as her pawn. Fairbanks intriguing alter ego could easily be hiding in plain sight. She could be attempting to frame Victor (Eric Braeden) in order to divert the coverup crew’s focus, as well as that of law enforcement, which she knows the four ladies in question can’t report her to. Then again, maybe Tessa’s rough background and many missteps simply make her look guilty, when she’s not? Fans of ‘The Young and the Restless’ rightfully express their opinions on a regular basis. So, is Tessa behind everything, meaning that she’s the only person who is tormenting the coverup crew and trying to frame Victor? Please vote in our poll below! Is Tessa Porter behind EVERYTHING? General Hospital Spoilers: Carly’s Jealousy Drives Sonny To Margaux?